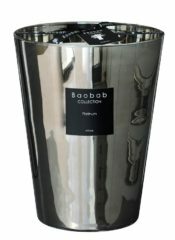 The Platinum Max 10 is a 500 g. hand poured, scented candle of the highest quality with an average burning time of 60 hours. 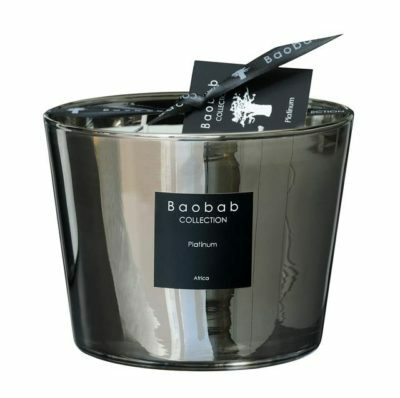 Since 2002 Baobab’s hand made perfumed candles have been lovingly made in Belgium. The raw materials are selected with extreme care. The refined fragrances have been elaborated by a well known perfumer in Grasse – temple of the world perfume industry. In terms of olfactory classification, the range scents are rated green, with a base note that has strong cedar sandalwood overtones. 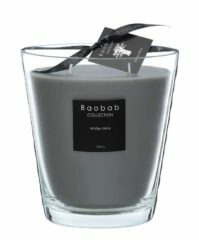 Then layered with individual and exotic tones to give exceptional longevity of aroma. The high quality of mineral and non-oily wax used is the most superior quality and purity available anywhere. 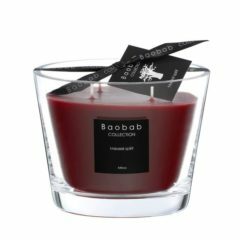 It will burn with an oil-like top layer (as only the best candles do) which will leave no trace of wax on the glass and evenly feed the expertly placed fine Egyptian cotton wicks. The platinum mirrored glass creates unusual reflections and wonderful light images while the candle flame remains visible from the outside. The play of light and scent found in the Platinum Scented Candle is an absolute highlight. The Platinum Series is limited.